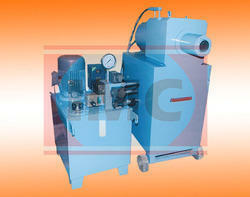 Prominent & Leading Manufacturer from Ludhiana, we offer tmt bar forging machine. 220 tons 40MM capacity, Hydraulic TMT Bar Forging Machine to be comprising of 01 No’s of Double Stroke Double Acting Hydraulic Cylinders of which one is the Hydraulic Clamping Cylinders & other is the Forging Cylinder, One nos of Forging Block with 01 nos Holder & 3 nos of Die Sets along with Punch & 03 nos of 7.5 H.P. Dual type (High Pressure & Low-Pressure Power Pack Unit.